Sipping wine poolside with friends was a great way to enjoy your summer days. Now that it’s fall use those saved wine corks and decorate your home with the perfect fall accessory. Apples! 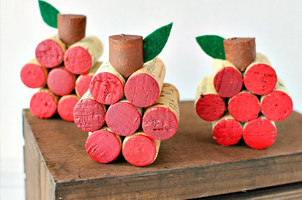 8 wine corks (per apple) – this includes the stem you cut, 1 cork will make 4 stems. Place 7 corks on a flat surface in three rows. Row 1: 2 corks; row 2: 3 corks; row 3: 2 corks. Make sure the flat/undamaged end of the cork faces down. Flip over the apple and paint the front, flat side, with red acrylic paint. You may need 2 coats. Let the paint dry completely between coats. While the apple is drying, make the stem. Bring a pot of water to boil, then place your stem corks in a metal colander or steamer basket and steam them over the pot of boiling water for 10 to 15 minutes. Use a utility knife to cut 1 cork in half lengthwise. Cut each half at an angle creating four pieces. Trim the angled end of each piece of cork to a point. And paint with brown acrylic paint. Let dry. Glue the stem to the top of the apple. Cut out a leaf shape with the green felt and attach to the stem with hot glue. Display the apples as part of your fall decorations!